“Andy’s legacy is certainly one of the true artist who had the ultimate freedom to do whatever he wanted in art. He taught us to be true to your vision, no matter what. 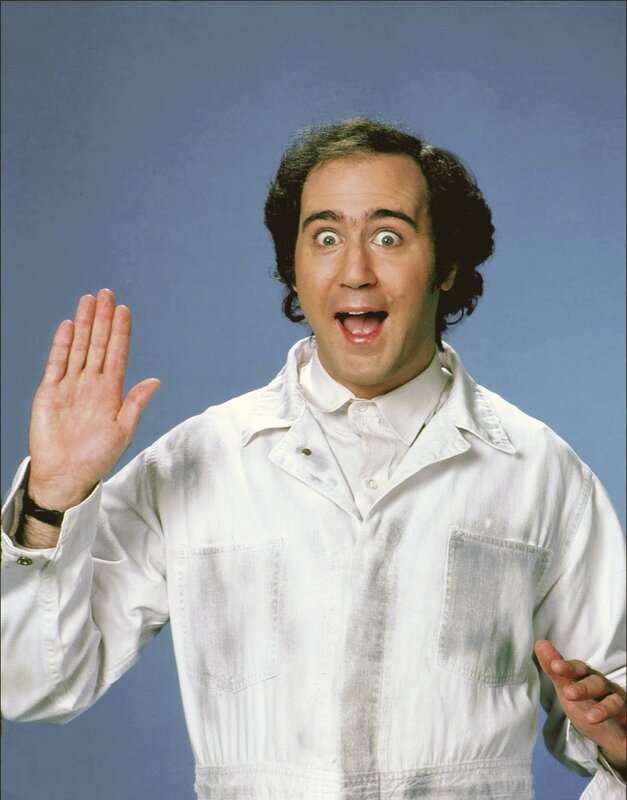 Nobody was freer than Andy Kaufman.” Bob Zmuda, Andy’s writer. Andy Kaufman died of lung cancer at age 25, on May 16, 1984. He was nowhere near as famous as Elvis, more of a cult comic than a popular legend. So why does the mythology persist? In part, he became sick and died very abruptly, a non-smoker with a very rare and deadly form of lung cancer. His death was improbable, but most deaths at 35 are improbable. Really, it’s the fact that he made a career out of lying, and lying really well. He may be the greatest deadpan the world has ever or will ever see. One of his final projects before his death was a straight-faced and utterly bizarre parody of “My Dinner with Andre,” entitled “My Breakfast with Blassie.” You can watch it right now on youtube. More on that later. He faked an amateur wrestling career, in which he only wrestled women (and accordingly faked a showdown with wrestler Jerry “the King” Lawler). This is well chronicled in his other faux documentary, “I’m From Hollywood,” which you can also watch right now. And he often assumed an alter ego in his stand up shows. Okay, go ahead and watch that too (this one is short). His comedy was innovative, and not always particularly funny (funny wasn’t really the point). Some of his well known performances include lip synching to the Mighty Mouse theme song, introducing Robin Williams as his grandmother to an audience at a show at Carnegie Hall, and impersonating Elvis as a foreigner from a fictional country. On one occasion, he began to cry uncontrollably as an audience jeered at him, then proceeded to pull out a toy cap gun, go backstage, fire into the microphone and fall down with a loud thump. Bob Zmuda recalls that he and Andy first met in 1974 in New York City at Budd Friedman’s Improv. They formed a partnership that lasted the length of Andy’s career. Early in Kaufman’s career, he opened for musicians, such as Barry Manilow and the Temptations. As he became more successful, he accepted a role on the tv comedy Taxi, basically playing his “foreign man” standup character. Taxi wasn’t his first television experience. During college, Andy Kaufman wrote, produced, directed, and starred in his own program on a campus TV station. Even in college, however, Kaufman was no novice to performance art. Andy began performing at age 8 at children’s birthday parties, in Long Island, where he spent his childhood. He was born in New York City on January 17, 1949.